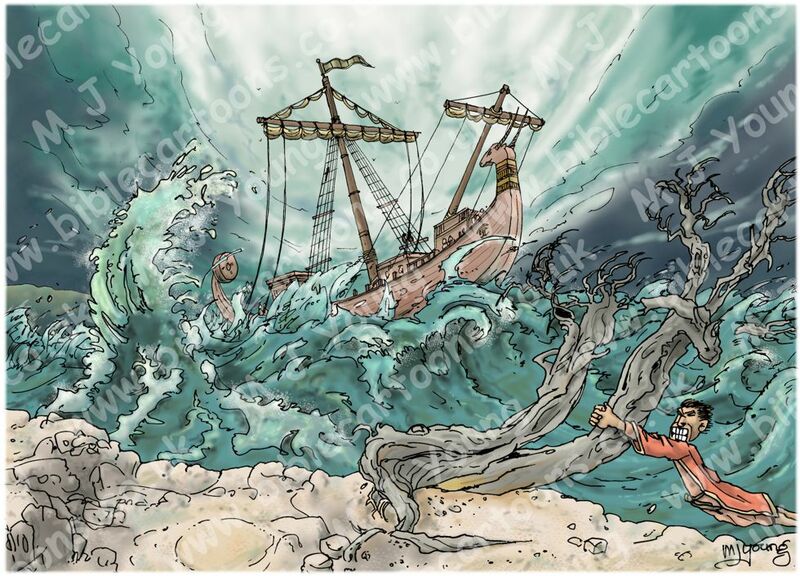 Bible Cartoons: Acts 27 - Sea storm - Scene 02 - Hurricane! 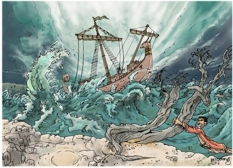 Bible Cartoon: Acts 27 - Sea storm - Scene 02 - Hurricane! 14 Before very long, a wind of hurricane force, called the “north-easter”, swept down from the island [Crete]. 15 The ship was caught by the storm and could not head into the wind; so we gave way to it and were driven along. Only a man who lives on the island of Cauda (who is hanging on to a tree in the hurricane winds) is visible in the foreground. There are also very small figures on the deck of the ship. This scene was specially requested by a customer. I don’t often get to draw the sea, or ships very often, so it was great to get the chance to draw this scene. I liked drawing the raging sea with all that foam. This view of the ship the apostle Paul was on, is seen from the small island of Cauda (Acts 27:16) just south of Crete. I put the man hanging on to the tree in the foreground in to illustrate the severity of the hurricane force winds.